Such thoughts must have been going through the minds of St. Thomas . . . until everything changed when he saw the Risen Christ. The story of Christianity has been around for 2,000 years and has become so familiar that we are desensitized to its profoundly shocking origins and message. Many believers take the Christian story for granted and non-believers view it as a collection of superstitious myths that should be relegated to history. The story of St. Thomas reminds us that the Christian story of God becoming Incarnate in the form of a poor peasant from a backwater town in the Roman Empire, having a short public ministry, being executed in a gruesome manner and rising in a new spiritual and material form was as absurd to the original disciples as it would sound to us today. In fact it is so absurd, if there were not hundreds of personal witnesses who have changed their life in ways that are counter-intuitive, it would not be believable. “his question also confers upon us the right, so to speak, to ask Jesus for explanations. We often do not understand him. Let us be brave enough to say: “I do not understand you, Lord; listen to me, help me to understand.” In such a way, with this frankness which is the true way of praying, of speaking to Jesus, we express our meager capacity to understand and at the same time place ourselves in the trusting attitude of someone who expects light and strength from the One able to provide them.” (Benedict XVI, Pope (2011-03-04). Jesus, the Apostles and the Early Church (pp. 92-93). Ignatius Press. Kindle Edition). During my “reconversion” back to Christianity, I had many doubts and I still do. Isn’t the Resurrection simply a nice tale that the early Apostles made up to promote their agenda? Isn’t the story of Jesus simply another fable of the God-Man archetype? If there truly is a God who can create the wondrous universe out of nothing, why would He care about creates as insignificant as humans? These are all great questions to which I respond as follows: Yes, the story of the Jesus fits a common archetypical pattern but for me that only adds to its authenticity. The story is so imbedded in the collective unconscious across cultures and generations that it seems only natural that if there is a God that wants to speak to humans, he would do so in a manner such as this. Further, the story of the Resurrection is so contrary to human experience that even the disciples, the people who were closest to Jesus, could not believe it until they saw the evidence. Moreover, the disciples changed their lives to promote a radical message of love and peace despite enormous personal suffering; they had no personal ego-centric agendas they were pursuing. There are many resources discussing what exactly the Resurrection means but two outstanding resources by modern scholars include N.T. Wright’s “The Resurrection of the Son of God” and James Arraj’s “The Bodily Resurrection of Jesus“. The latter is available online for free here. Yes, I still have my doubts about the Christian story but the witnesses of the early Christians, the intellectual justification of people far smarter than I and most importantly, some personal experiences that I have had convince me that the story is true. 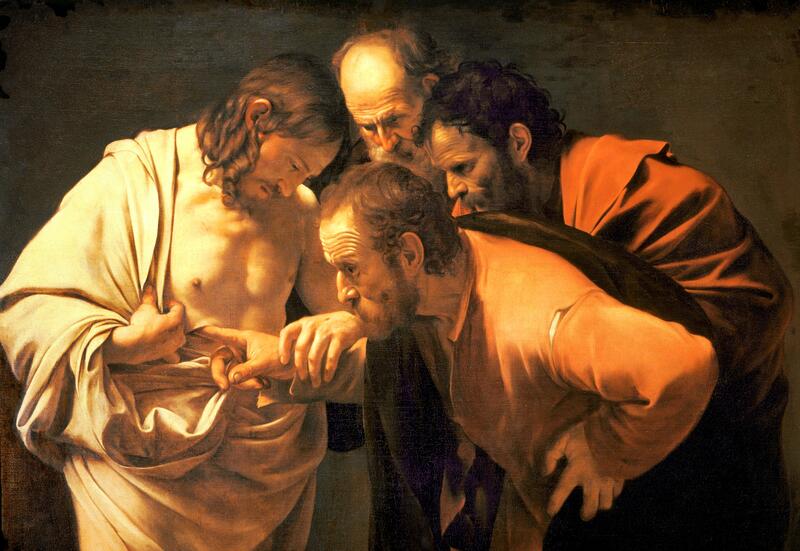 This entry was posted in Embracing Doubt and Mature Faith, Reason and Faith, Uncategorized and tagged Catholic, Christian, Divine Mercy, doubt and faith, faith and doubt, historicity of the Resurrection, James Arraj, N.T. Wright, resurrection, Second Sunday of Easter, St. Thomas, Sunday Readings, Sunday Reflection. Bookmark the permalink. William, I doubt you and I would be blogging about this if it had not taken place two thousand years ago… What a Spirit was released that it still carries us today! Well said Claire! It was truly an amazing historical event that has changed the lives of billions and continues to be active in the world.